Este artigo é sobre the faction. Para the class, veja Blade. Once Sky Haven Temple is entered during Alduin's Wall, it will become the head of all Blades operations in Skyrim and you may live here if you choose to, so long as you get along with the Blades. You may recruit up to three followers to join the Blades. The first recruit will take the oath right away, while the other two will begin training. The new recruits will train, patrol the area, and live in Sky Haven Temple, their former lives over. 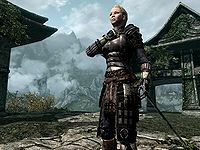 The Blade recruits will train with either Delphine, or one of the targets and training dummies; they will always use their preferred skill when training. The Dragonslayer's Blessing may be received from Esbern upon request as well. 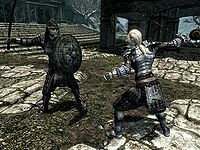 The Blades will always show an opposition to the pacifist Greybeards, taking a stance that all dragons must be destroyed. The Blades recruits may also accompany you on trips to slay dragons living near dragon lairs. All Blade recruits wear the standard Blades armor, which is governed by the Heavy Armor skill, so keep this in mind when choosing recruits. 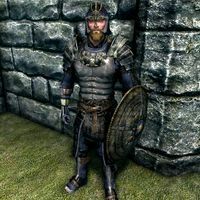 Before the follower joins be certain to retrieve any armor, helmet or shield that you might wish to keep since they are removed from the game and replaced by Blades equipment. Esta página foi modificada pela última vez à(s) 00h54min de 31 de agosto de 2015.